The California almond industry shipped a record 201.6 million lbs in September, building momentum on the strong shipment performance in August. After two months, YTD shipments are ahead of last year by 102.4 million lbs and 38%. 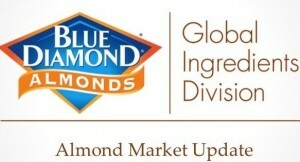 Commitments grew even faster, with a record 359 million lbs of new business booked in September. Current commitments are 639.6 million lbs, 199.3 million lbs and 45% more than at the end of last September. The U.S. market is up 12% YTD, with two consecutive months of growth after 10 months of lower shipments. Shipments to India are up 82% compared to last year with over 2,000 containers being shipped in August and September. India will absorb these containers in the next 8 weeks with the upcoming Diwali festival, pipeline fill and natural growth in the market. China shipments are up 85% compared to last year with Chinese New Year and the E-Commerce 11/11 still ahead. China will continue to look for additional coverage in the next 5 -6 weeks. Middle East shipments rebounded to 115% greater than last year, driven by growth in Turkish imports. Shipments to the EU are up 22% as pipelines are being filled for the holiday season at lower prices than the last few years. Spain is also looking at a smaller crop than originally expected forcing additional buys from California. The 2016 Crop is currently shipped and committed 30% higher than the prior two years. Total supply will be ~2.5 billion, sufficient to allow no more than 10-12% growth at year-end. Prices will rise to slow the pace of growth over the balance of the year. The early increase in shipments and commitments is driven by a high share of Nonpariel inshell and kernel activity. Buyers patiently waiting for prices to decline over the summer months saw an inflection point in September, as prices begin increasing, gaining $.30-.40 since the beginning of September. 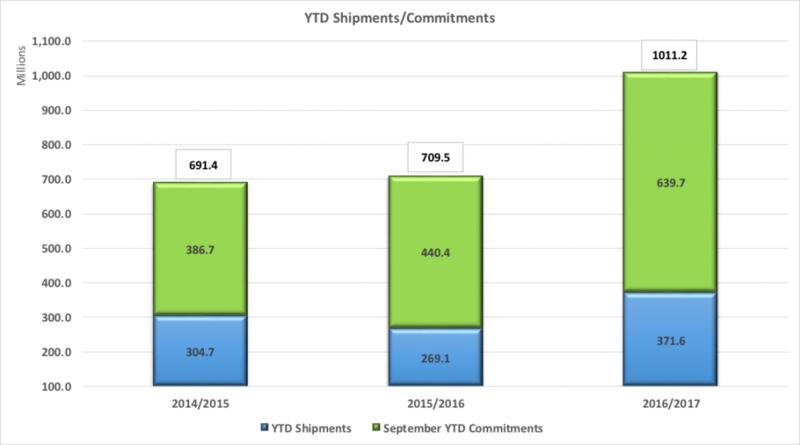 October through December, growth in year-over-year shipments will continue based on the large early commitments. New highs for 2016 Crop pricing will be tested in the next three months as the early growth levels need to moderate to balance with supply.